Maybe this will shut Sue up! 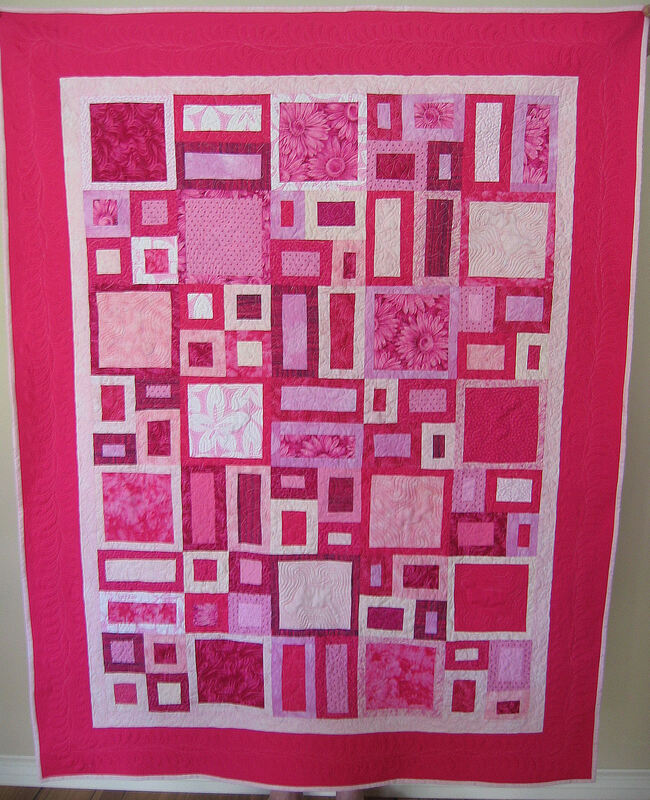 My good friend Sue, who lives in San Diego, California, LOVES pink. She’s the classic ‘pink princess’ — her phone is pink, her laptop is pink, she buys pretty much anything I make that’s in pink fabrics. I stitched some 130,000 quilting stitches (don’t worry — the machine counts them for me). 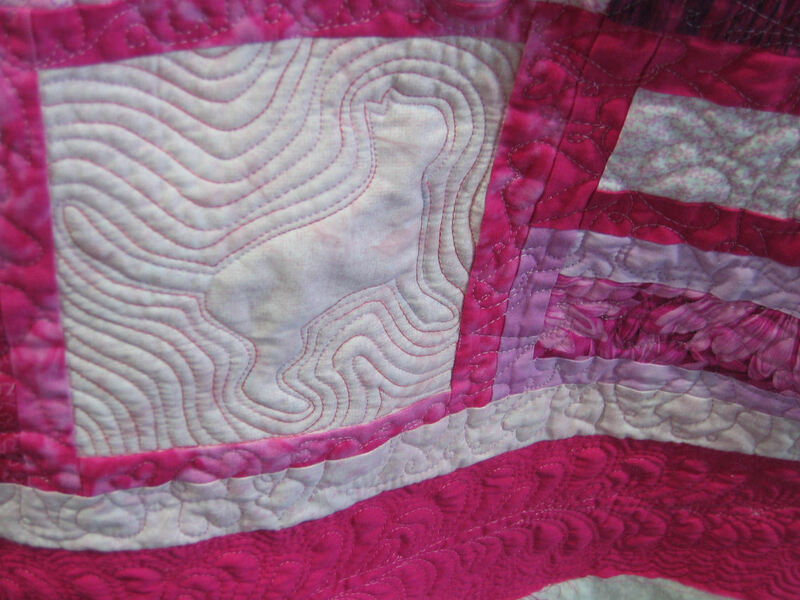 All quilting is free motion and done on my HQ Sweet Sixteen — the only marking I did was for the cat outlines (Sue’s a cat person). 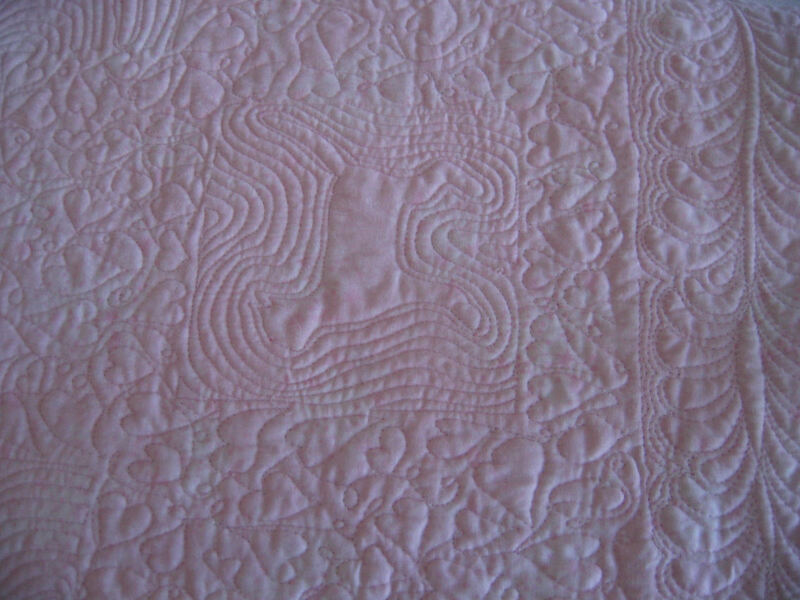 Each large block contains a cat, echo quilted in a variegated pink rayon thread (Guterman Sulky?). 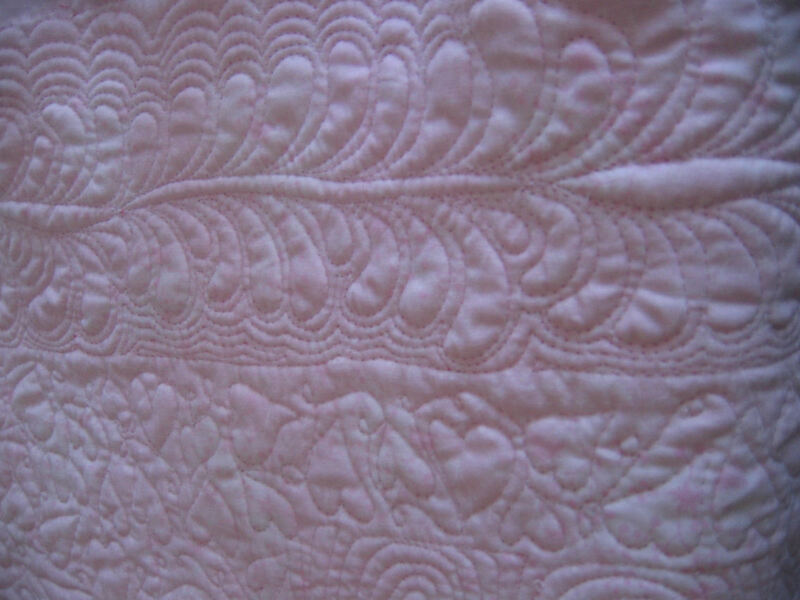 The rest of the quilting is one continuous line of hearts and loops, done using a soft pink Robison Anton rayon thread. 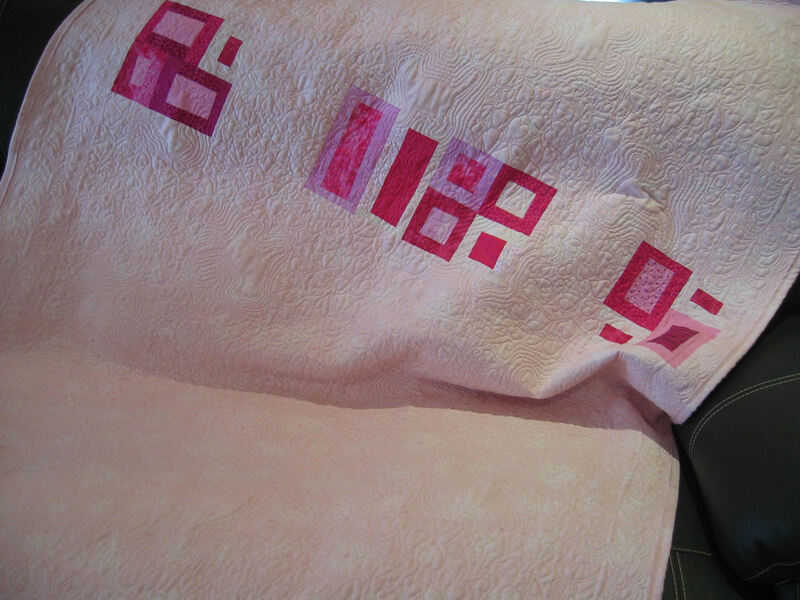 The bobbin thread is a soft pink Deco-Bob thread (I used 2.5 bobbins for the quilting). 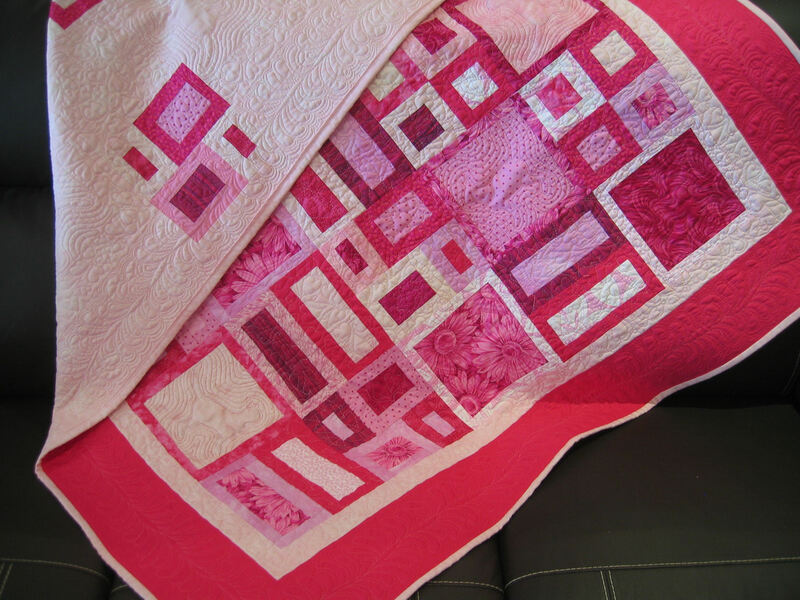 The border quilting is free motion feathers (a la Diane Gaudynski), with a wavy stem — done in a darker pink rayon thread (Floriani), and echo quilted with a deep watermelon coloured thread (Mettler Metrosene). 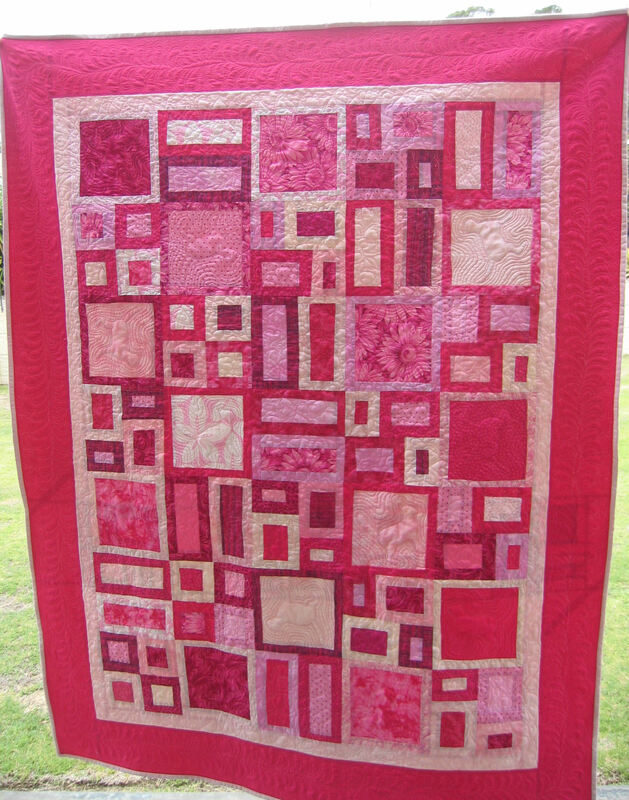 The pattern is a variation on ‘Surround’ from Four Paws Quilting. So, yes, this is going to shut me up. Reduce me to tears, make me be speechless with emotion and awe and love… Absolutely the most beautiful thing. I smile every time I look over at it… It just makes me feel happy!!! And Rhonda? I cannot thank you enough!! Really, I have no words. Other than I love you, and thank you!!! You really are one special friend! !